If your daily commute has become mundane and boring, you can easily spice things up with this clever hack that makes it feel like you've just jacked someone's ride. All you need is an old screwdriver—the more worn it is the more convincing the effect will be—and a car key you're willing to hack to bits. Basic metal-working skills probably aren't going to hurt here, and will ensure your screwdriver key doesn't immediately fall apart the first time you use it. 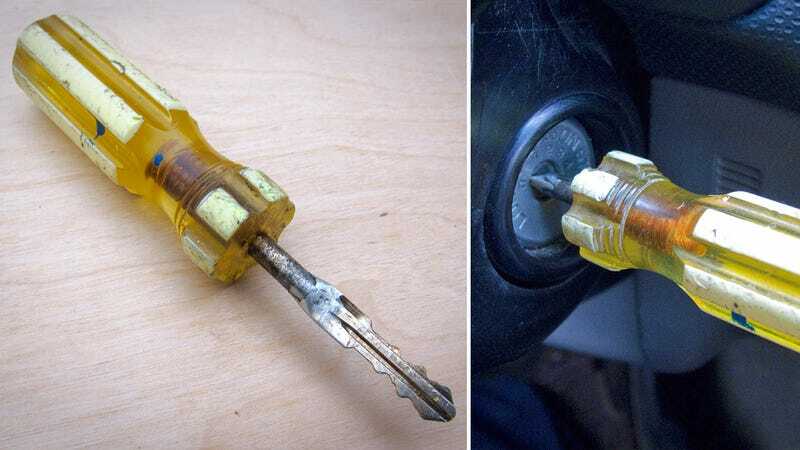 Be warned, though, as the creator of this hack points out, the handle hanging off your key adds a lot of weight and leverage that could probably screw your ignition if bumped. And if your car's key uses a chip, this hack unfortunately isn't for you.